File Shortstop Ruddy Giron, who hit .285 with Fort Wayne last year, is San Diego’s fourth-ranked prospect. Giron is one of six returning players from the 2015 team. Top prospects Ruddy Giron and Michael Gettys are back. But what really made the TinCaps’ season-opening roster pop when announced Saturday was pitching talent. Austin Smith, the No. 8 prospect in the San Diego Padres’ farm system, is joined by Logan Allen (No. 9), Jacob Nix (No. 10), Enyel De Los Santos (No. 14), Phil Maton (No. 22) and Jean Cosme (No. 30) on a staff that could excel. "Things are shaping up for this to be a fantastic season," TinCaps president Mike Nutter said in a statement. "At this level it’s especially difficult to predict how things will pan out, but it seems like the Padres have provided a bevy of exciting young players for fans to come see at Parkview Field." Giron, a shortstop who hit .285 with Fort Wayne last year, is San Diego’s fourth-ranked prospect, while Gettys, who hit .231, is rated No. 11. The other prominent new arrival is Austin Allen, a 22-year-old catcher picked in the fourth round of the amateur draft last summer. A left-handed batter, Allen hit .240 with short-season Tri-City in his pro debut out of the Florida Institute of Technology. The low-A TinCaps will be carrying 13 pitchers and 12 position players when they open play Thursday at Lake County for a two-city, four-game series that shifts to Fort Wayne on Saturday and Sunday. Besides Giron and Gettys, returning players include lefty Taylor Cox, righty Walker Lockett and utility players River Stevens and Luis Tejada. Tejada – a Midwest League All-Star for Fort Wayne in 2013 – is actually listed as an outfielder, alongside Gettys, Jhonatan Pena and Rod Boykin, who stole 19 bases for Tri-City in 63 games last year. There are six infielders: Giron, Stevens, Ty France, Kodie Tidwell, Peter Van Gansen and Brad Zunica. A.J. Kennedy – a 30th-round pick last summer – will back up Allen behind the plate. And rounding out the Fort Wayne pitching staff are Lou Distasio, Will Headean, Brett Kennedy, Emmanuel Ramirez and Gerardo Reyes. Maton is the only pitcher to have saved a game in 2015 (six saves and a 1.38 ERA at Tri-City). The mixture under first-year manager Anthony Contreras consists of five international signings, seven guys who entered professional ball out of high school and 13 who signed out of college. 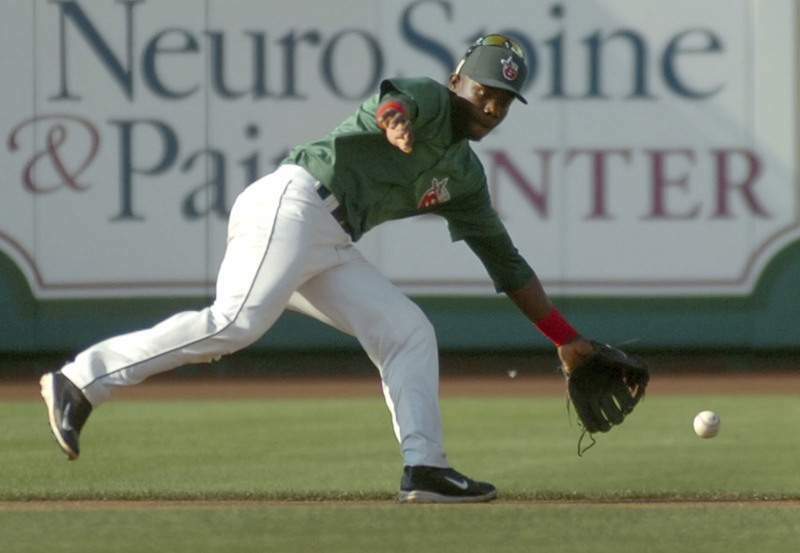 The TinCaps have four teenagers, but 18 of their 25 players are between 20 and 22. As far as hometowns, this roster has less foreign flavor than did last year’s, although this one has players who hail from the Dominican Republic, Mexico and Puerto Rico. With Norwell graduate Josh VanMeter moving up to high-A Lake Elsinore, there are no Indiana natives on the season-opening roster in Fort Wayne. But 10 of the 50 states are represented: Alabama, Maine, California, Florida, Georgia, Illinois, Louisiana, Missouri, New Jersey and Tennessee.